A lot of single use plastic bags end up in landfill, because we use them to line our bins. What can we do to avoid this? With plastic bag bans increasing, and the awareness around the issue of plastic pollution growing, it seems that plastic bags are on the decline. Which is great news, except it begs the question… what is a good alternative to use to line the rubbish bin? As with many of these plastic-free dilemmas, there is more than one solution. This might not work for everybody, and it usually isn’t the first step, but have you considered not using a liner at all, and simply rinsing out the bin between uses? The first question to ask is: what is actually going into my bin? Is there food scraps and stinky stuff? Or is it just dry, clean non-recyclables like plastic packaging and mixed-material products? Whilst you’re getting a food waste recycling system set up – or if you just don’t have the energy for this at the moment – and you have space, consider using a large yoghurt tub with a lid / lidded bucket to collect food scraps and keep in the fridge or freezer until bin day, and empty these directly into the external bin. 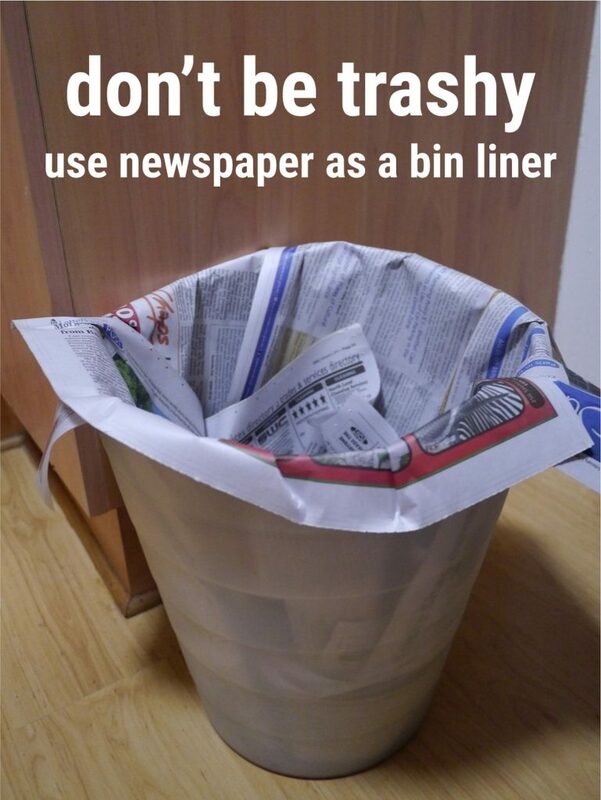 Here is a video about how to line your bin with newspaper. Using old newspaper means repurposing something already in existence, and no new plastic is consumed. If you have large paper bags, old cardboard boxes or other packaging, consider using these to line your bin (or to replace your bin). You might find it possible to empty the contents into an external bin and reuse the vessel again. With all paper and cardboard, it is better to recycle than to compost, and to compost rather than to landfill. However, repurposing something that has already been used is better than buying something new. Plastic bags were only actually invented in the 1960s. We managed before, and we can manage again.